The UK Open Champion averaged a lofty 104.54 as he charged to a 6-1 victory over home favourite Mike Holz. However, it was Aspinall's finishing that was the most impressive, landing six out of his seven attempts (85.71%) as he frustrated his opponent. After losing the opener, the Stockport ace then won six straight legs - bookmarked with a blistering middle spell that saw him take out checkouts of 123, 82 on the bull, 114 and 121. The German couldn’t handle this onslaught from the 28-year-old, who picked up the remaining two legs with back-to-back 13 darters. World Youth Champion Dimitri Van den Bergh, fresh from his performance as a Contender in the Premier League in Rotterdam on Wednesday, looked good as he edged out Steve Beaton 6-4. Having trailed 4-2, a match-high 110 checkout put him back within one, and he then clinched the next three legs to win 6-4. Mark Dudbridge cinched a shock victory over home-favourite Gabriel Clemens. The game was finely poised at 4-4, but it was the 2005 World Championship finalist who edged over the line, sealing the win with a 105 checkout. Former World Youth Champion Keegan Brown also produced some late heroics as he beat Madars Razma 6-5. Having led 5-2, he looked to have blown his chance as the Latvian star fought back to 5-5, but a 116 checkout in the deciding leg saw Brown over the line and into the second round. Jamie Hughes put in arguably the second best performance of the evening as he saw off Tytus Kanik 6-4. Trailing 4-3, the former Lakeside Championship semi-finalist put together three straight legs to ensure his place in the second round. Mervyn King will face Dave Chisnall on Saturday as he edged out Brazil’s Diogo Portela 6-4, whilst Mario Robbe set up a second dound clash with James Wilson after beating Maik Langendorf 6-3. There was success for German favourite Steffen Siepmann as he comfortably defeated Mickey Mansell 6-2. Earlier in the day, Simon Stevenson set up a second round tie with Jonny Clayton by defeating Dave Prins 6-2, reeling off five straight legs from 2-1 down and sealing the win with a 117 finish. 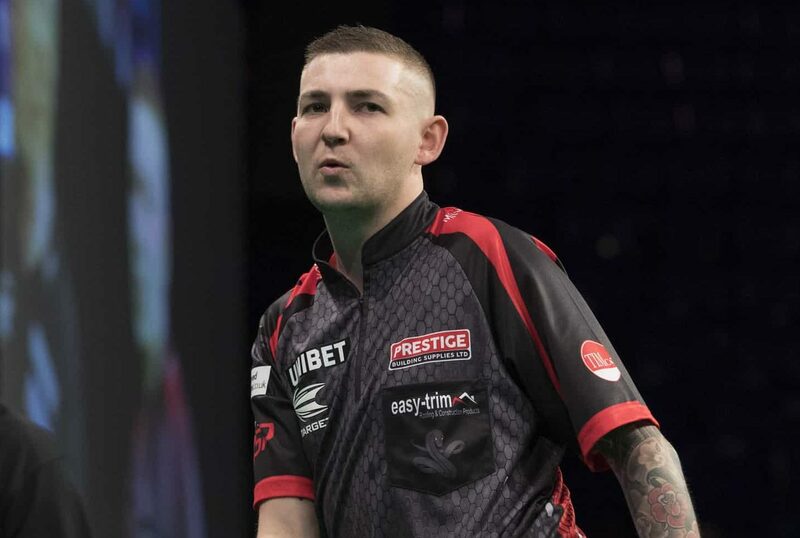 World Championship quarter-finalist Luke Humphries averaged 100.71 and hit six doubles from 11 attempts in his 6-2 win over Martin Atkins, who took out 116 in defeat as the Newbury ace moves through to play Darren Webster. Ricky Evans came from 31 down to claim a superb 6-4 win over former European Tour winner Robert Thornton, finishing crowd-pleasing checkouts of 167 an 132 as he set up a second round meeting with Mensur Suljovic. Russia's Boris Koltsov soared through to a second round tie against James Wade by whitewashing Germany's Jyhan Artut 6-0, with legs of 13, 12, 15 and 11 darts putting him in control before a 116 finish helped secure a superb win. Andrew Gilding produced finishes of 160, 130 and 110 as he came from 2-1 down to win 6-3 against Belgian qualifier Mike De Decker, setting himself up for a tie with Peter Wright. German qualifier Kevin Knopf enjoyed a 6-4 win over Scott Taylor on his stage debut, and he will now take on two-time World Champion Adrian Lewis. Dutchman Ron Meulenkamp will now take on former World Champion Rob Cross after coming from 2-0 down to defeat Finland's Kim Viljanen 6-4. Andy Boulton defied finishes of 108 abd 146 from Josh Payne to set up a second round tie against Daryl Gurney with a 6-4 win, landing two 12-darters in the victory. The Second Round action of the 2019 German Darts Championship gets underway on Saturday from 1300 local time (1200 GMT) on PDCTV-HD and various bookmaker's websites.